The presents have been unwrapped, the stockings have been emptied. And, the winners this year in our house are the wooden toys! My preschool daughter received a Melissa and Doug Gleeful Garden Wooden Bead Set from Santa and has since spent hours and hours making beautiful necklaces for all the family members and then disassembling them and making more. This is by far her favorite gift (and maybe the least expensive one, too). Who would have guessed? Santa brought the little guy a Rainbow People Mover from North Star Toys and he has enjoyed pushing it around the house, making the vroom sound and tossing the colorful people out of their seats. (His sister has tried to steal the toy several times, too. She likes to sort and count the people and drive them to pretend destinations.) North Star Toys (www.northstartoys.com) is a great source for simple, non-toxic, American-made wooden toys. I won ours from a blog contest at 3 P's Mama Says, but will be keeping the company in mind for future baby gifts. What were your kids' favorite toys this Christmas? My 3 year old loved her dress up cloths. Thanks for stopping by! We have fog here mostly right now. :( I love the wooden toys! My kids loved toy soldiers and babies for Christmas this year. :) Have a great New Years! Those are great toys! My little mans favorite from Christmas is his Melissa and Doug vehicle puzzle. He loves all the "buses"! Both look wonderful and congrats on the contest win! I love the car w/people -- I was looking at similar for tub toys recently. Nice toys! My son's favorite toys this Christmas are all of the textured balls he received. Hello, thanks for stopping by. The wooden toys are the best! 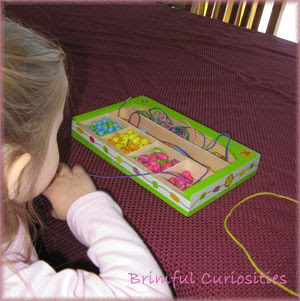 The little pull toy is very much like a therapy toy we used for fine motor control. You could easily cut out shapes with a hole in the center and tell him to sort them. Mine did this over and over. 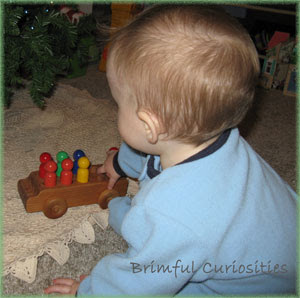 Wooden toys are looking so nice and colorful... My kids love to play with them... This wooden bead set is looking so nice!! Wooden toys are great for kids because they are not easily broken.